Hopefully, your workplace is full of friendly staff, inspirational leaders, motivational managers and a constant supply of chocolate muffins! However, there’s always one person who annoys the hell out of you and constantly gets on your nerves. So, imagine the following dilemma: what would you do? Are you interested in improving your English speaking skills in a relaxed way? If yes, the Inglés Málaga Chat Room conversations classes with Janette will be able to help you! 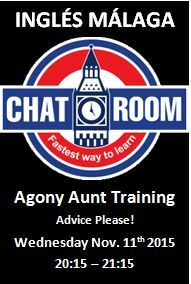 Inglés Málaga Chat Room: Agony Aunt Training: Advice Please! If yes, the Inglés Málaga Chat Room sessions with Janette will be able to help you! 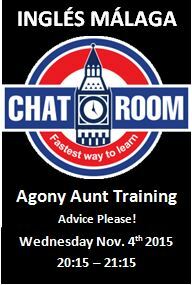 Chat Room Session: Agony Aunt Training: Advice Please! You are trying to persuade your teenage child that eating vegetables is a beneficial thing. What would be the most effective strategy? You and your partner have 2 children and you have decided to get on the property ladder and buy a house. What do you buy? Your best friend is an overweight couch potato but he has decided that he wants to become a professional body builder. He thinks the best way to transform his body is to have plastic surgery and to take chemical enhancers. You, obviously, think he’s a complete nutjob! What advice would you give him?